A surprisingly excellent pinot noir leads our oenophile to Amherst’s Ankida Ridge Vineyards. My trip to Linden Vineyards was my first venture in an exploration of Virginia wine. The plan for my next wine excursion became clear when I tasted an extraordinary pinot noir at a pairing dinner at Fleurie restaurant in Charlottesville; I wanted to meet the person who had made that fantastic wine. I had never seen a Virginia pinot noir before, and for good reason. The vines like a cool climate, the grapes have thin skins and are one of the most challenging grapes to grow. I reached out to the producer at Ankida Ridge Vineyards using the contact tab on the winery’s website, and the reply was prompt and gracious in response to my request for a visit. Christine and Dennis Vrooman are the owners of Ankida Ridge, and their son, Nathan, is winemaker. After a few exchanges we settled on a date for a visit to the winery. I hadn’t taken any notes when I originally sampled the wine, so I was eager to procure a bottle before our meeting. This is no easy feat when there are fewer than three hundred cases produced annually. I also had only a week before our meeting. On my one day off, I took a cycling trek around Alexandria. I made a stop at a wine shop that was new to me. After intently studying the shelves and choosing purchases, I happened upon the Virginia rack. There was the 2013 Ankida Ridge Pinot! I told the proprietor how thrilled I was at the find and that I was soon to visit Ankida. He remarked that he, too, was surprised by the quality of the pinot. He also mentioned that he was impressed with their vinho verde-style white wine. I pedaled off, delighted at my unexpected luck. That night I opened the bottle and poured about two ounces for tasting. The first thing I found notable is the color of the wine; it was translucent ruby and you could easily read through it. 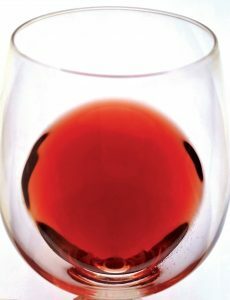 A casual wine drinker may think this indicates a thin or poor-quality wine. Quite the contrary; this color is exhibited in pinot noir from the world’s best regions. Then I took a whiff of the wine and was completely stunned at the familiar complexity of the nose. On the first sip, the hairs on my arms stood up. I began pacing the floor, glass in hand, thinking, “This isn’t possible!” Tart cherry, raspberry, pomegranate fruit. Forest floor, mushroom, earthiness. Complexity, bright acidity, nice finish, moderate tannin and alcohol. It was so familiar to me, as that is the very description of a lovely Burgundy. It also brings to mind an Oregon producer called Cristom that is, unsurprisingly, often described as Burgundian. While I hadn’t had doubts about what I’d experienced at that Fleurie wine dinner, formally tasting the wine was a revelation. I am not exaggerating with this recounting. I can honestly say the 2013 Ankida Ridge Pinot Noir is the most exciting wine I have had from Virginia. After two hours of air, it seemed to improve (but that may have been the wine talking!). I made my way to Amherst, and met with Nathan later that week. It was a day of heavy thunderstorms, which briefly subsided as I passed through Albemarle County. This made for a stunning drive on Route 29, as springtime buds were beginning to appear in the landscape. Ascending long country roads, I finally spotted a handcut wooden “winery” sign. Continuing on I discovered the tasting room beyond several buildings, up a steep embankment. There were sheep grazing on the near-vertical slopes. I’m a sheep farmer, and these animals struck me more like mountain goats. Elevation and slope are two elements of huge importance in a vineyard site. At 1,800 feet, Ankida is one of highest in our state and certainly one of the steepest. Winemaker Nathan Vrooman crushes the grapes into must, freshly pressed juice that is then fermented. Nathan had the entire Ankida wine lineup ready for me to taste. There are two estate wines: the Ankida Ridge Pinot Noir and Ankida Ridge Chardonnay. I tasted the 2014 and 2015 pinot noirs. The 2015 bottles weren’t even labeled yet. They both had those benchmark Burgundy characteristics and complexity. For me, the 2014 pinot presented as fresher, more lifted. For the 2015, a new technique was added to the winemaking. One barrel had 25 percent stem inclusion, and used only vineyard yeast for fermentation. The difference was notable, and the Vroomans are rightfully pleased. For me, the wine is more perfumed and a little more structured. It really evolves with more time in the glass. The chardonnay was also excellent, with great acidity and balance. Tropical fruits, along with apple and pear notes, led my mind to the southern Burgundy regions of Macon and Côte Chalonnaise for comparison. I recently recommended a bottle of Ankida Chardonnay to a couple looking for a Virginia wine to have with dinner. Their response was ecstatic. 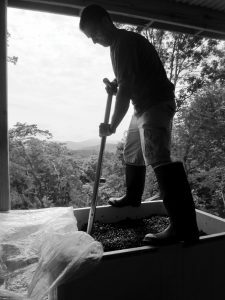 There are three “Rockgarden” wines in the portfolio that Nathan produces from carefully selected Virginia sites. White vinho verde is a simple, very light wine from Portugal that has been gaining popularity for years. It has low alcohol and a slight effervescence. The “Rockgarden Vert” is a delicious wine inspired by this style, yet is a little more substantial and satisfying than classic vinho verde. This is a wine to enjoy now and all the way through fall. Made from merlot, cab Franc, and cabernet, the “Rockgarden Rouge” is a fruit forward, nicely made example of the familiar Virginia Bordeaux blend. There is also a tasty port style dessert wine, the “Rockgarden Vin Doux”; as it is a fortified wine, they can actually bottle this one to order. We were joined by Nathan’s father, Dennis, and I got the winery and winemaker’s story. Dennis and Christine Vrooman bought the property in 1990s. The secluded mountain getaway was a hardscrabble farm until the ‘40s, when it was largely abandoned. After deciding to plant a vineyard, the Vroomans hired noted vineyard consultant Lucie Morton. The slope, elevation, temperature, drainage, and other elements of the site led to the suggestion of pinot noir. The vineyards were planted with a family celebration in 2008. “My father thought we’d plant the vineyard in a few days,” Nathan recalled. “We got through about half a row,” he smiled. At that time, Nathan was in Colorado working in finance. He relocated to Charlottesville in 2009. After much family discussion, it was decided Nathan would make the first vintage in 2010. He immediately signed up for viticulture courses at Piedmont Virginia Community College. It was there he met Rachel and Scott Stinson, a father/daughter team who had just started their Stinson winery. In 2010, Stinson had little fruit and Ankida had a harvest but no winery. By chance, they both had the same winemaking consultant, Matthieu Finot. In a case of perfect serendipity, they agreed to make the inaugural Ankida Ridge vintage at the Stinson facility. As it turned out, 2010 was a hot year. In late August, Finot was traveling to France. Needing his advice, Nathan, the nascent winemaker, frantically phoned him for approval to pick much earlier than expected. While changing planes in Detroit, Finot got the voicemails and gave the go ahead. A true family operation, the Vroomans’ Maremma sheepdog is part of the team. “That was the first and only harvest we picked by hand,” Nathan said. “So, now you use machines?” I asked. “We pretty much knew right then and there,” he replied. They took the 2010 Pinot to a wine blogger conference when it was bottled in 2011. It began turning heads upon release. In 2011, Ankida Ridge erected its own winery/tasting room. In 2012, a tiny creature presented a challenge of mammoth proportion. A few weeks before harvest, Christine noticed some flies in the vineyard. She shook the canopy, and a cloud of insects appeared. After reaching out to a number of specialists and universities, she was horrified at the conclusion. They were the first in Virginia to report the spotted wing drosophila. This is a fruit-destroying invader from Japan. It was too late to kill the flies, so several steps were taken to mitigate the problem. At harvest, Christine and Nathan walked ahead of the picking crew, dropping rotting fruit from the clusters. The destemming machine, coupled with an extra detailed sorting, further served to separate any comprised juice from good. Resourcefulness “on the fly,” so to speak. Dennis provided an evocative recollection: “I left on a Sunday as the fruit was beginning to ripen, and it looked beautiful. I entered the vineyard a week later, and smelled a blast of vinegar.” They still managed to produce a good wine in 2012, albeit less of it. They now use traps and a natural spray that protects the fruit to prevent the pest from taking hold. In 2016, a major forest fire came perilously close to Ankida Ridge. Nathan showed me a harrowing video of the scene, with helicopters dropping loads of water. It was just a stone’s throw from the main house on the property. That same year, Ankida Ridge was invited to present at the International Pinot Noir Celebration held in Willamette Valley, Oregon. As it turns out, I’m not the only one who was stunned that a wine like Ankida’s Pinot could be made in Virginia. Greeted with some initial skepticism, resounding accolades were later expressed. This was a major accomplishment, which put both Ankida Ridge and Virginia as venues on the world-class wine map. 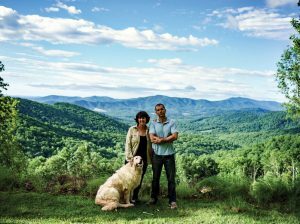 Also that year the Vrooman’s daughter, Tamara, launched the Commonwealth Collective, a promotional group that includes four Virginia wineries: Early Mountain, Veritas, Stinson, and Ankida Ridge. Tamara is based in Atlanta, and uses the collective to showcase Virginia wine to other states. I suggest a visit to the beautiful Commonwealth Collective website. I always ask about winemakers’ future plans for these articles. In May, the Vroomans planted three-and-a-half more acres of vines. This will essentially double their production, making it the maximum their facility can process. The new plantings are largely pinot noir, a small amount of chardonnay, and a tiny amount of gamay. As a huge fan of Cru Beaujolais, the announcement of gamay is enticing to me. Nathan and Rachel are now married and are expecting their first child near harvest time, so they may require extra help this year. After Ankida Ridge Pinot Noir provided an adjustment in perception, anything is on the table for Virginia wine. Cheers! The Ankida Ridge tasting room is open from noon to 5 p.m. on Saturdays. I suggest a visit to this exciting Virginia producer. If you happen upon the wine on a restaurant list, I recommend the selection. I also asked about any other Virginia wineries they find interesting or notable. They suggested Granite Heights and Lovingston. I had such a great time tasting and visiting with Dennis and Nathan. I thank all the Vrooman’s for their warmth and generosity. « What NOT To Do If You Get Bitten!